Desktop backup allows either creating a copy of “My Desktop” Windows folder, which contains all objects shown on your desktop (main screen), or saving “desktop” PC data and operating system (say, “backup desktop Windows Windows 10”). Handy Backup solves these tasks easily and efficiently! Easy to Use. Handy Backup copies all desktop data through a “My Desktop” plug-in in the “User Folders” group. Just click onto the “My Desktop” on the left panel, and the program will automatically select all objects for Windows desktop backup. All you need after it is to select a proper storage for your desktop backup! Many Storage Solutions. 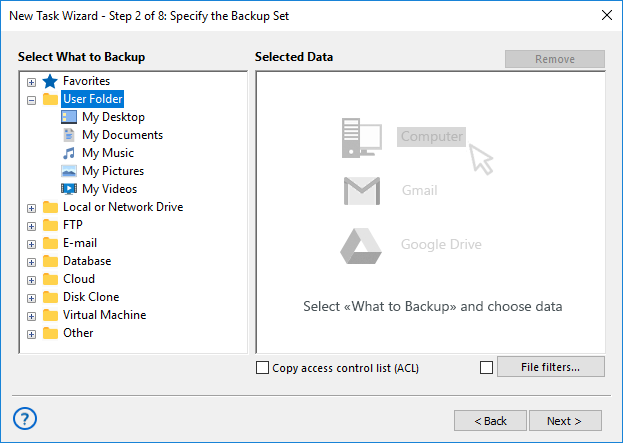 You can select a desktop backup drive, either local or external, or even a shared network resource (e.g., a NAS disk or a remote shared folder) for backing up desktop content. You may also use some FTP server or perform desktop cloud backup to such storage as Dropbox, OneDrive or Google Drive. Advanced Desktop Backup Options. You can use other backup options, including making incremental or differential backup, keeping different backup versions on the same storage, and scheduling your task by an exact time and repeating interval. In addition, you can use an advanced task wizard with much more backup options! All you need for Windows desktop backup, from a plug-in to save your workspace to a collection of available storage methods to the Disaster Recovery utility, in a single Professional solution! If your Desktop is used for easy access and management of computer programs and documents, and you want to backup data intended for regular use, then Handy Backup is the right solution for you. 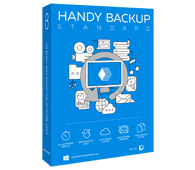 Handy Backup solves the question of protecting its data from accident deletion or loss through an integrated preset called Desktop Backup. Why Should I Choose Handy Backup? Handy Backup is intuitive backup software friendly to people with different level of experience with computer technologies. Simple, fast and easy to use! With Handy Backup the simple way to save files is the secure way. Encrypting the backup data allows you to secure chosen files, regardless of type and size. You can compress the backup files if you wish to save space. Files will be saved in Zip format, the most popular compression format among Windows users. You can choose day and even certain time when you want Handy Backup to start backing up desktop and how often to repeat. Automate your backups! Give your desktop a reason to be eternally thankful to you, as it thrives through a data misfortune after a timely backup. Download and rejoice now! Free 30-days trial version! How to Make Windows Desktop Backup? Sure, it is easy! Just follow the instruction provided here. Open Handy Backup. Create a new task with a “New” button. Select a backup task. On the Step 2, click onto the “My Desktop” on the left panel. In a new window, mark the checkboxes against data that you plan to back up. When finishing, click OK. Click “Next” to proceed. On the Step 3, select your desktop backup drive or other storage. Click “Next” again. On all other steps, select task parameters that you need, or just click “Next” to proceed. On the final step, give your task a name. Click “Finish”. That is all! In the next video you can see how this solution backing up Windows desktop. Note: Instructions in this video suggest that you already have Handy Backup installed on your computer. If you still haven’t done so, don’t hesitate to download it for a 30-day free trial!